Dendritic cells (DCs) can influence HIV-1 and SIV pathogenesis and protective mechanisms at several levels. First, HIV-1 productively infects select populations of DCs in culture, particularly immature DCs derived from blood monocytes and skin (Langerhans cells). However, there exist only a few instances in which HIV-1- or SIV-infected DCs have been identified in vivo in tissue sections. Second, different types of DCs reliably sequester and transmit infectious HIV-1 and SIV in culture, setting up a productive infection in T cells interacting with the DCs. This stimulation of infection in T cells may explain the observation that CD4+ T lymphocytes are the principal cell type observed to be infected with HIV-1 in lymphoid tissues in vivo. DCs express a C-type lectin, DC-SIGN/CD209, that functions to bind HIV-1 (and other infectious agents) and transmit virus to T cells. When transfected into the THP-1 cell line, the cytosolic domain of DC-SIGN is needed for HIV-1 sequestration and transmission. However, DCs lacking DC-SIGN (Langerhans cells) or expressing very low levels of DC-SIGN (rhesus macaque monocyte-derived DCs) may use additional molecules to bind and transmit immunodeficiency viruses to T cells. Third, DCs are efficient antigen-presenting cells for HIV-1 and SIV antigens. Infection with several recombinant viral vectors as well as attenuated virus is followed by antigen presentation to CD4+ and CD8+ T cells. An intriguing pathway that is well developed in DCs is the exogenous pathway for nonreplicating viral antigens to be presented on class I MHC products. This should allow DCs to stimulate CD8+ T cells after uptake of antibody-coated HIV-1 and dying infected T cells. It has been proposed that DCs, in addition to expanding effector helper and killer T cells, induce tolerance through T cell deletion and suppressor T cell formation, but this must be evaluated directly. Fourth, DCs are likely to be valuable in improving vaccine design. Increasing DC uptake of a vaccine, as well as increasing their numbers and maturation, should enhance efficacy. However, DCs can also capture antigens from other cells that are initially transduced with a DNA vaccine or a recombinant viral vector. 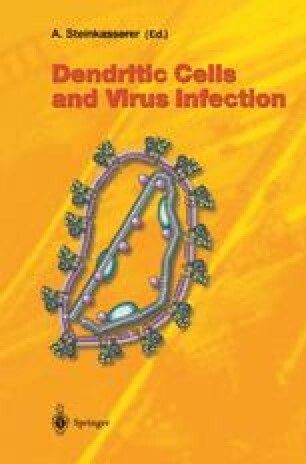 The interaction of HIV-1 and SIV with DCs is therefore intricate but pertinent to understanding how these viruses disrupt immune function and elicit immune responses.